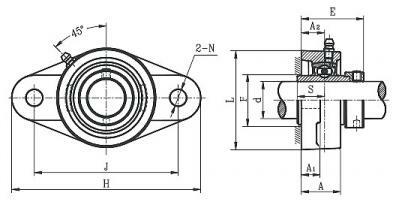 HCFL206-18 Flanged Mounted Bearing with eccentric collar lock. the inner diameter is 1-1/8" inch. 1 1/8 " 5 19/32 " 4 19/32 " 15/32" 1 3/16 " 5/8 " 25/32 " 1 31/32 " 3 7/32 " 0.7165 "